USB 3 is the third major iteration of the USB (Universal Serial Bus) standard. When it was first introduced, USB provided a truly remarkable improvement in how peripherals connected to a computer. Previously, serial and parallel ports were the norm; each required a detailed understanding of both the device and the computer hosting the device in order to set up the connection properly. While there had been other attempts at creating an easy-to-use connection system for computers and peripherals, USB was perhaps the first to successfully become a standard on just about every computer, regardless of the manufacturer. USB 1.1 started the ball rolling by providing a plug-and-play connection that supported speeds from 1.5 Mbit/s to 12 Mbits/s. USB 1.1 wasn't much of a speed demon, but it was more than fast enough to handle mice, keyboards, modems, and other slow-speed peripherals. USB 2 upped the ante by providing up to 480 Mbit/s. Even though the top speeds were only seen in bursts, it was a significant improvement. External hard drives using USB 2 became a popular method of adding storage. Its improved speed and bandwidth made USB 2 a good choice for many other peripherals as well, including scanners, cameras, and video cams. USB 3 brings a new level of performance, with a new data transfer method called Super Speed, which gives USB 3 a theoretical top speed of 5 Gbits/s. In actual usage, a top speed of 4 Gbits/s is expected, and a continuous transfer rate of 3.2 Gbits/s is achievable. That's fast enough to prevent most of today's hard drives from saturating the connection with data. And it’s fast enough for use with most SATA-based SSDs, especially if your external enclosure supports UASP (USB Attached SCSI Protocol). The old adage that external drives are slower than internals is no longer always the case. Raw speed isn't the only improvement in USB 3. It uses two unidirectional data paths, one to transmit and one to receive, so you no longer need to wait for a clear bus before sending information. USB 3.1 Gen 1 has essentially the same characteristics as USB 3. It has the same transfer rates (5 Gbits/s theoretical max), but can be combined with the USB Type-C connector (details below) to provide up to 100 watts of additional power, and the ability to include DisplayPort or HDMI video signals. USB 3.1 Gen 1/USB Type-C is the port specification used with the 2015 12-inch MacBook, which provides the same transfer speeds as a USB 3.0 port, but adds the ability to handle DisplayPort and HDMI video, as well as the ability to serve as a charging port for the MacBook’s battery. USB 3.1 Gen 2 doubles the theoretical transfer rates of USB 3.0 to 10 Gbits/s, which is the same transfer speed as the original Thunderbolt specification. USB 3.1 Gen 2 can be combined with the new USB Type-C connector to include recharging capabilities, as well as DisplayPort and HDMI video. USB Type-C (also called USB-C) is a mechanical standard for a compact USB port that can be used (but isn't required) with either USB 3.1 Gen 1 or USB 3.1 Gen 2 specifications. 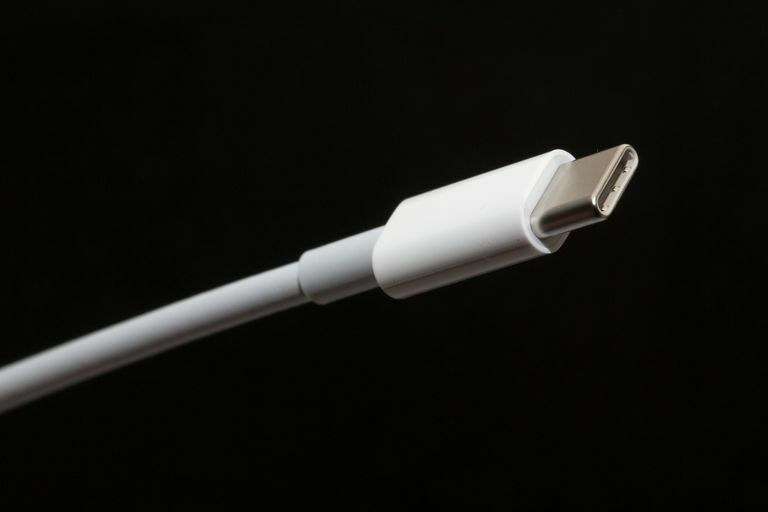 The USB-C port and cable specifications allow a reversible connection, so a USB-C cable can be connected in any orientation. This makes plugging a USB-C cable into a USB-C port a whole lot easier. It also has the ability to support more data lanes, allowing data rates up to 10 Gbits/s, as well as the ability to support DisplayPort and HDMI video. Last but not least, USB-C has a larger power handling capability (up to 100 watts), allowing a USB-C port to be used to power or charge most notebook computers. While USB-C can support the higher data rates and video, there's no requirement for devices with USB-C connectors to make use of them. As a result, if a device has a USB-C connector, that doesn't automatically mean the port supports video or Thunderbolt-like speeds. To know for sure you have to investigate further, to find out if it's a USB 3.1 Gen 1 or USB 3 Gen 2 port, and which capabilities the device manufacturer is using. USB 3 uses a multi-bus system that allows USB 3 traffic and USB 2 traffic to operate over the cabling simultaneously. This means that unlike earlier versions of USB, which operated at the top speed of the slowest device connected, USB 3 can zip along even when a USB 2 device is connected. USB 3 also has a feature common in FireWire and Ethernet systems: a defined host-to-host communications capability. This capability lets you use USB 3 with multiple computers and peripherals at the same time. And specific to Macs and OS X, USB 3 should speed up target disk mode, a method that Apple uses when transferring data from an older Mac to a new one. USB 3 was designed from the onset to support USB 2. All USB 2.x devices should work when connected to a Mac equipped with USB 3 (or any computer equipped with USB 3, for that matter). Likewise, a USB 3 peripheral should be able to work with a USB 2 port, but this is a bit dicey, as it depends on the type of USB 3 device. As long as the device isn't dependent on one of the improvements made in USB 3, it should work with a USB 2 port. So, what about USB 1.1? As far as we can tell, the USB 3 specification doesn't list support for USB 1.1. But most peripherals, including modern keyboards and mice, are USB 2 devices. You'd probably have to dig pretty deep in your closet to find a USB 1.1 device. Apple chose a somewhat interesting way to incorporate USB 3 into its Mac offerings. Almost all current-generation Mac models make use of USB 3.0 ports. The only exception is the 2015 MacBook, which uses USB 3.1 Gen 1 and a USB-C connector. No current Mac models have dedicated USB 2 ports, as you'd commonly find in the PC arena. Apple used the same USB A connector most of us are familiar with; the difference is that the USB 3 version of this connector has five additional pins that support the high-speed operations of USB 3. This means you must use USB 3 cabling to get USB 3 performance. If you use an old USB 2 cable that you found in a box in your closet, it will work, but only at USB 2 speeds. The USB-C port used on the 2015 MacBook requires cable adapters to work with older USB 3.0 or USB 2.0 devices. You can recognize USB 3 cabling by the logo embedded in the cable. It consists of the letters "SS" with the USB symbol next to the text. For now, you may only find blue USB 3 cables, but that may change because the USB standard doesn't require a specific color. USB 3 isn't the only high-speed peripheral connection that Apple uses. Most Macs have Thunderbolt ports that can operate at speeds of up to 20 Gbps. The 2016 MacBook Pro introduced Thunderbolt 3 ports that support speeds of 40 Gbps. But for some reason, manufacturers still aren't offering many Thunderbolt peripherals, and the ones they do offer are very expensive. For now, at least, USB 3 is the more price-conscious approach to high-speed external connections. Which Macs Use Which Versions of USB 3?